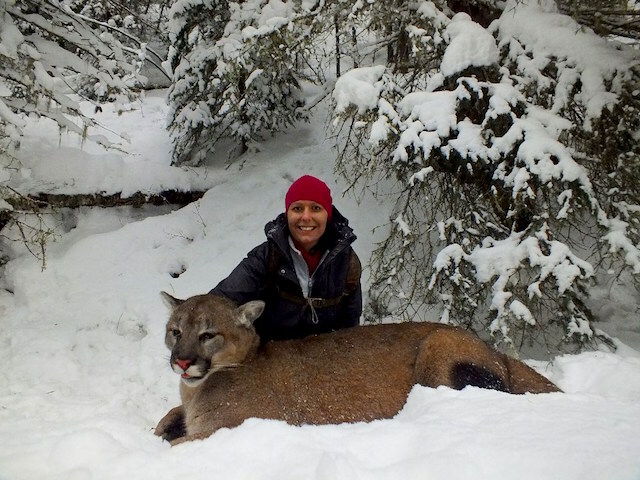 DESI GREGORY of Strathfield, Australia, came to Alberta, Canada along with her Grandfather, Emmanuel, looking for adventure and harvested this nice cougar in January after a long hike through some really deep snow. 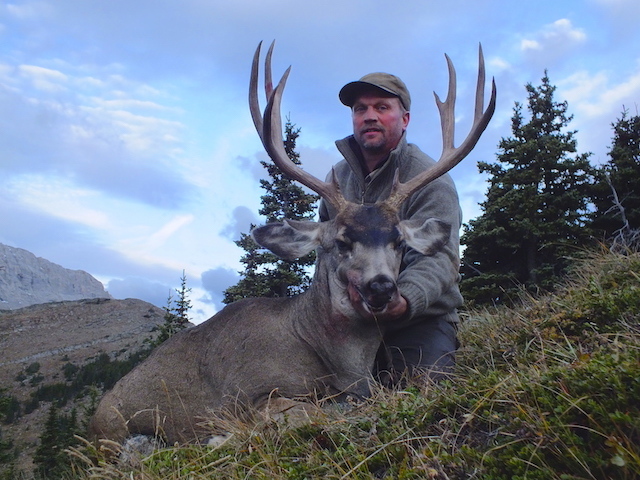 RUSSELL FORBES of Kitchener, ON, came back to Alberta in September to hunt for trophy mountain mule deer on horseback, ahead of his antelope hunt. 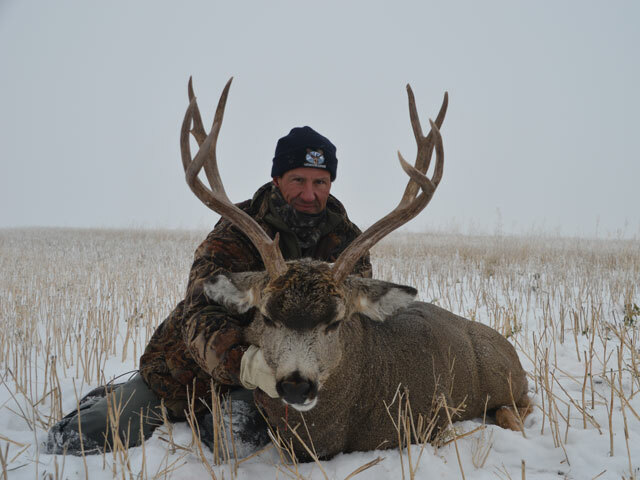 He shot this big heavy buck in a high country basin after riding up the mountain from camp as the fog began to roll in. The buck was spotted with barely enough time for a shot before he dissappeared into the mist. 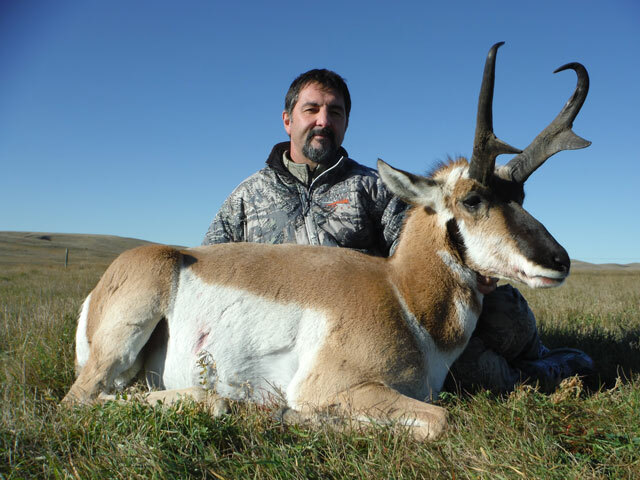 We then headed out to the prairies for pronghorn antelope, where Russ took this tall pronghorn buck. We had made a long stalk on this buck earlier that day but could not get within range. Luckily we were able to find him again and had the perfect topography to sneak in for a close shot. 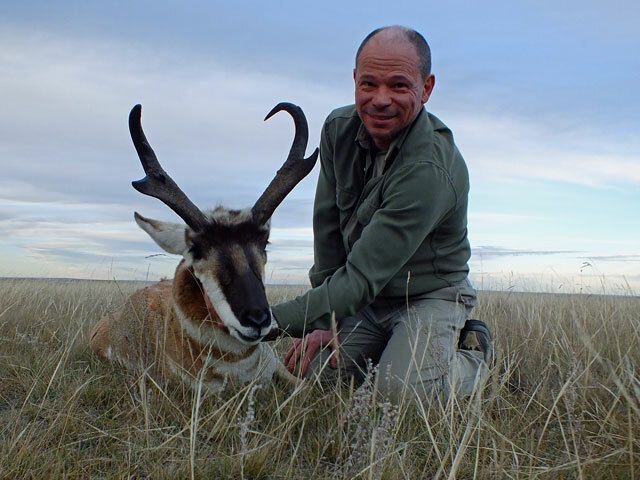 JOHN DONATO, of Cambridge, ON with his wide and long pronged antelope. We had some great cover along a fenceline for our first stalk, but could not get a shot through the tall weeds. He patiently waited for the buck to make his way back to the stubble field and made a long, careful crawl to take the shot. 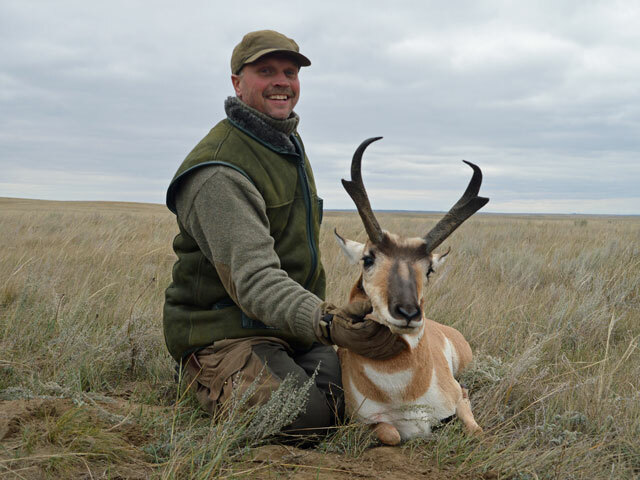 FINN NIELSEN of Denmark with his pronghorn buck, taken after a belly-crawl to get within shooting distance. 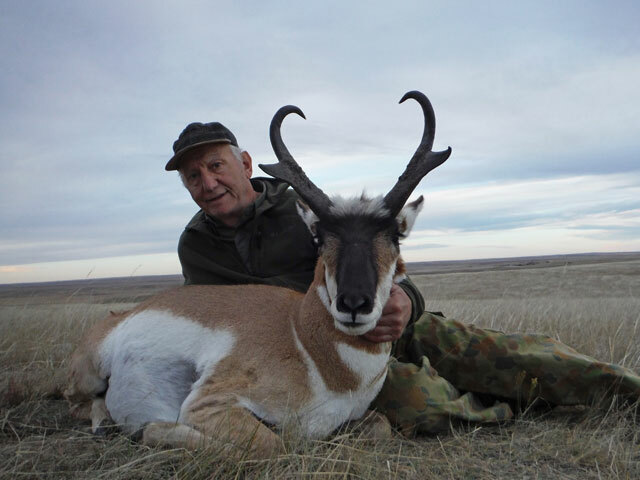 KIM RASMUSSEN of Denmark with his high pronged antelope. Kim made an amazing stalk in some unusually cold and windy weather to get on this buck. 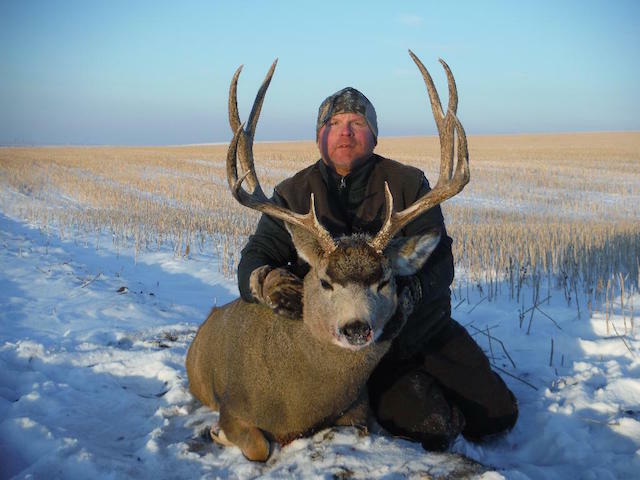 FINN NIELSEN of Denmark with his super heavy mule deer. Finn and his friend Kim (below) hunted the opening of mule deer season in the mountains, during the last week of September. We rode in the darkness of a blood red lunar eclipse hoping to find a bachelor group of bucks up in a high mountain basin. At first light Finn and Kim (Below) shot their deer within seconds of each other... and then watched incredulously as a cougar came out of the trees and began to drag one of the bucks away. The cougar decided to give it up when he saw us approaching. What an amazing adventure! 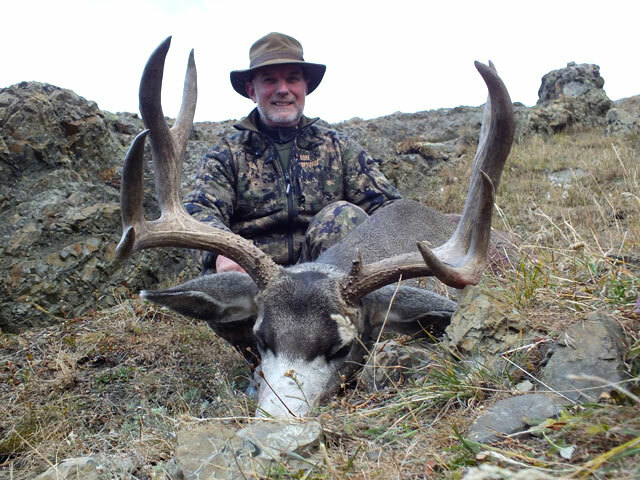 KIM RASMUSSEN of Denmark with his tall, handsome mountain mule deer. Fortunately the cougar did not damage his beautiful cape as he packed it into the trees. 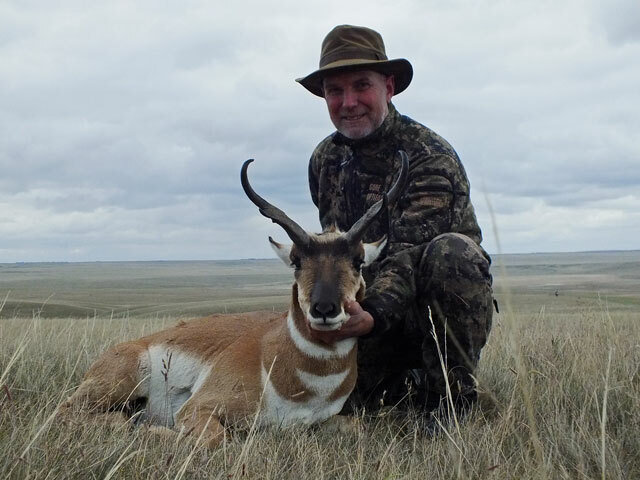 SHAWN WALSH, of Oyama, British Columbia and his pronghorn. This antelope has the nubby look that some bucks get from age. We spotted him the first morning and went back to look for him a couple of days later. We waited quite a while in the shade of some round bales before the buck finally got out of his bed and came towards us giving us a shot. 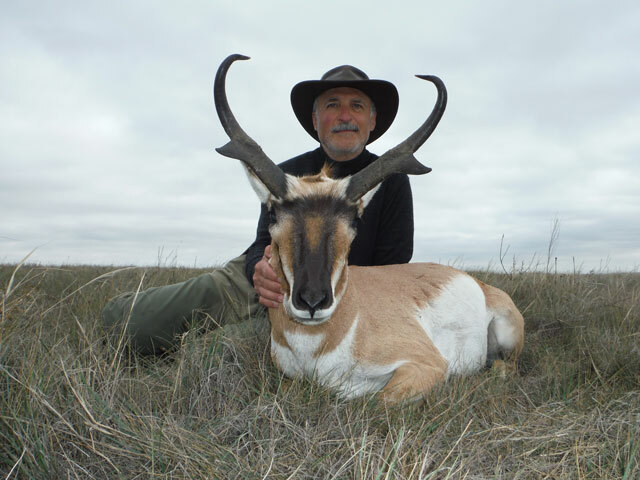 EMMANUEL GREGORY of Strathfield, Australia with his gorgeous pronghorn antelope. This buck has everything: weight, prongs, and extra length in a nice curl. After an easy stalk in some hilly country this buck walked right within range. 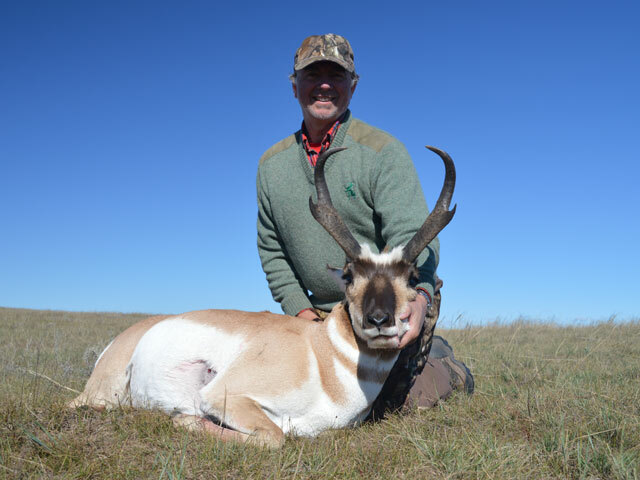 JOHN HLAUDY of Meadville, PA, with his great pronghorn, taken a short time after and not far from Emmanuel's above. 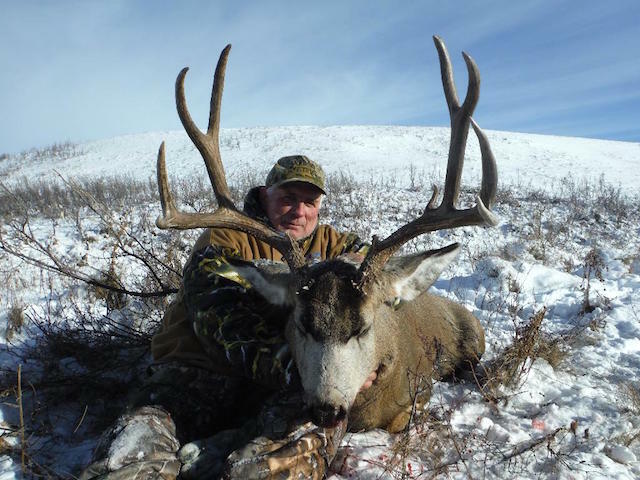 REX SMITH of Grand Rivers, KY, with his bladed and webbed prairie muley. Nice brows too! 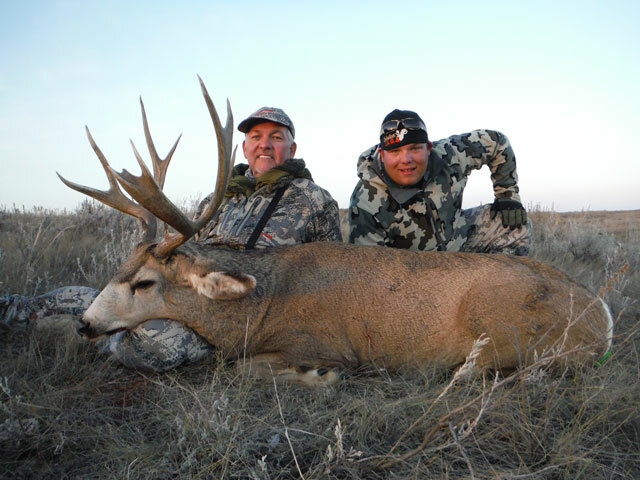 Rex brought his son Jay and friend Brett along with him to Alberta to hunt mule deer. 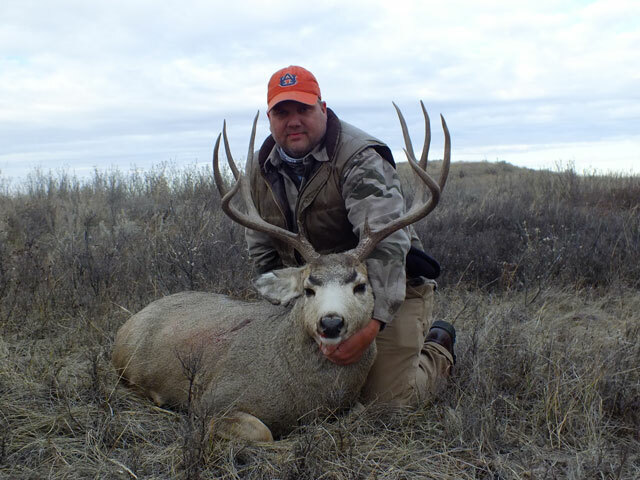 JAY SMITH of Grand Rivers, KY, took home this tall muley buck. Jay and his dad Rex had an exciting stalk to get within a few yards of this deer after watching him head to bed. Jay made a great shot when the buck jumped up. BRETT KIK of Madisonville, KY, harvested this nice muley at close range just like his friends Rex and Jay above - they were all prepared for longer shots! We spotted the buck in some sand hills and while we were trying to close the distance he appeared right in front of us! 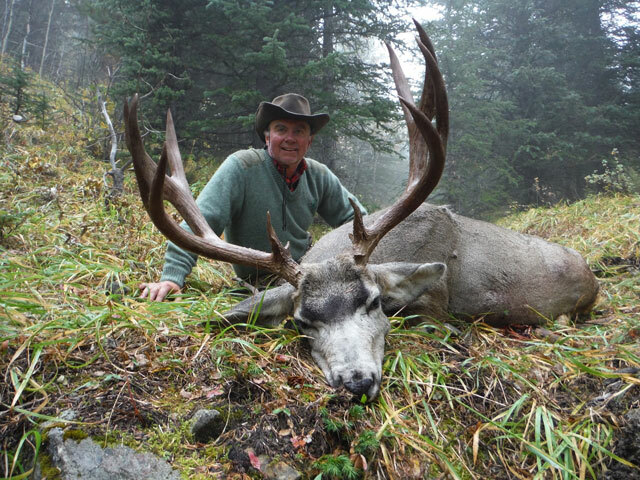 PETE KLAETSCH of Whitefish, MT, with his perfect muley. It took us a couple stalks to get within range of this deer, then we had to wait patiently in the cold for him to get up from his bed. Thank goodness for the sun on our backs. GARY SHARA of Baraboo, WI, with his beautiful buck taken only a couple miles from his son-in-law Pete's above. We saw him drop into the coulee early in the morning. It was a very tricky stalk avoiding other deer on our way, but we did it! 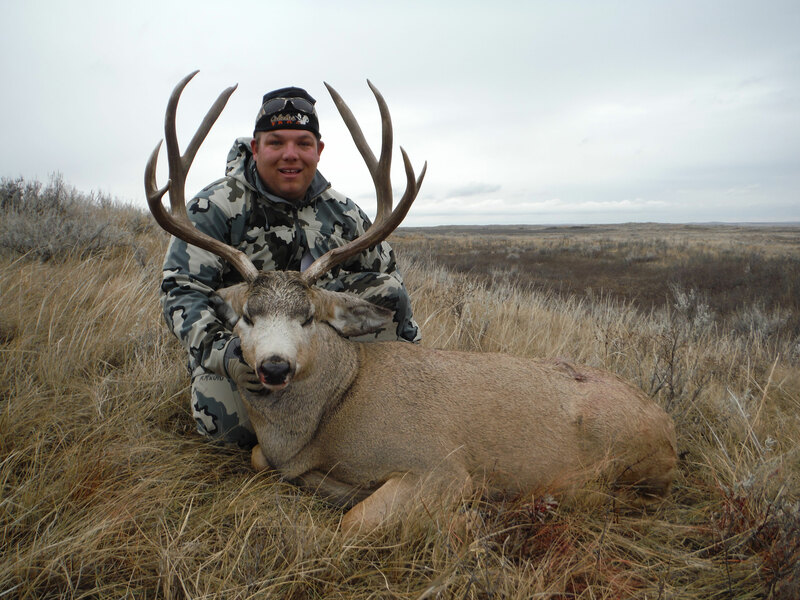 JOE CENTENO of Santa Maria, CA, took this nice muley buck on the first day of his hunt when the buck appeared in the fog. 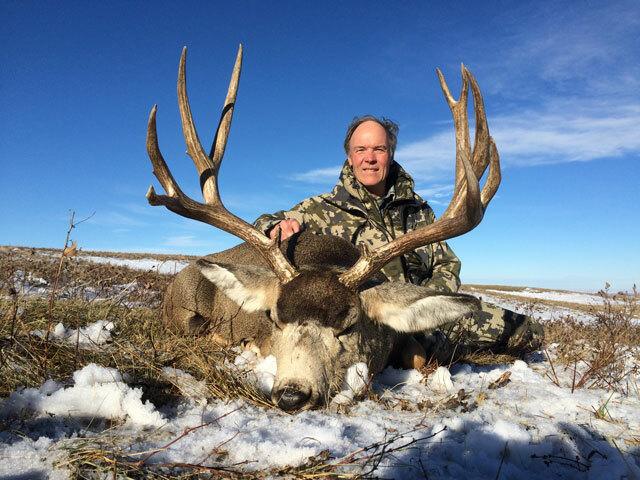 BILL WILSON of Missoula, MT, took this great muley on the third day of the hunt. The buck had vanished on us the day before and we were thrilled when we found him again. 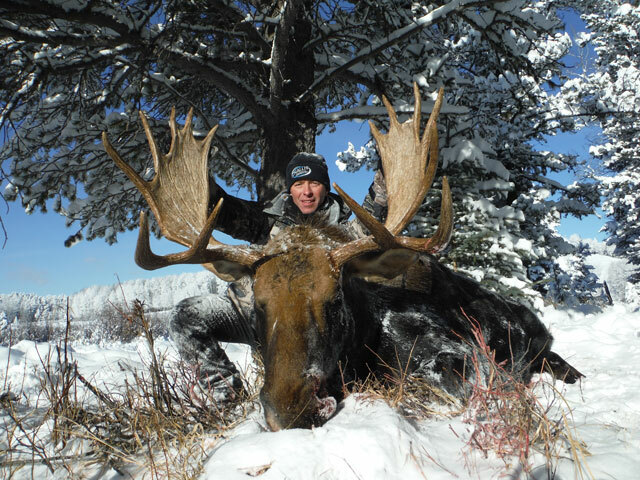 JAMIE CHALLIS of La Grande, Oregon, with his Shiras moose bull. A great way to end a fantastic season! It is always an honour to share your experiences and successes with you! Thanks to everyone who joined us and made 2014 another memorable year for us. Brad Stuparyk, Darren Daniel, Dale and Penny Silbernagel, John Gordon, and Carole Frei. We hope you can join us sometime soon.